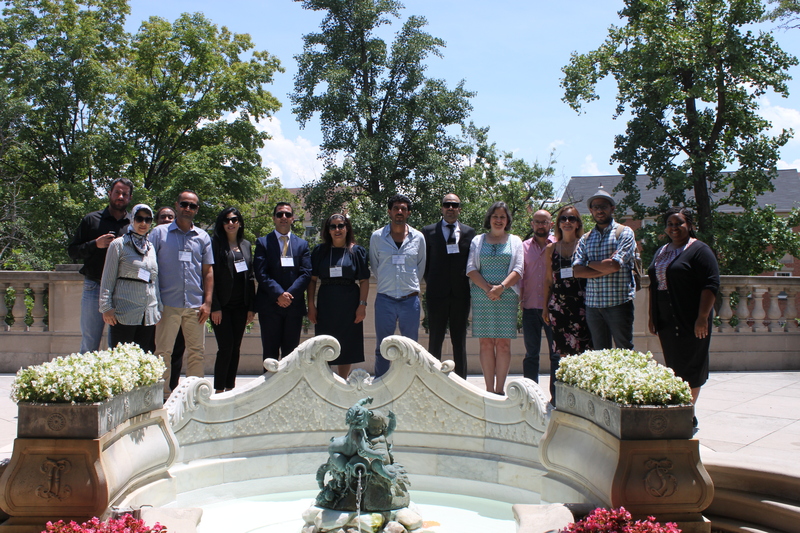 On Thursday, July 6th Meridian welcomed twelve individuals from eight nations from the Near East Asia and North Africa for the "Voices of Reason: Speaking Out Against Da'esh" International Visitor Leadership Program (IVLP). 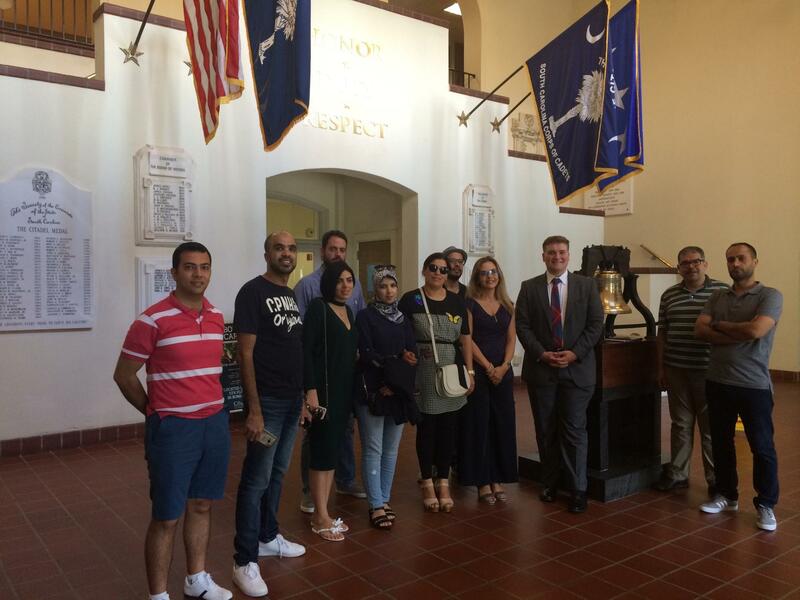 The IVLP brought together a diverse mixture of professionals including journalists, non-profit leaders, and government officials with the goal of discussing successful strategies for encouraging citizens to oppose violent extremist ideology. Participants were also able to take part in in high level meetings that examined best practices to defeat Da'esh and foster partnerships with U.S. organizations committed to similar campaigns. After convening in Washington, the group traveled to New York, NY; Charleston, SC; and Denver, CO before closing out their program in Minneapolis, MN. While in Washington, the group had the opportunity to meet with Dr. Tamara Kharroub, Assistant Executive Director and Senior Middle East Analyst at the Arab Center Washington DC to discuss policy analysis and recommendations on what motivates violent extremism. The participants appreciated discussing the role of the U.S. military in countering and eliminating the drivers of violent extremism with Lieutenant Colonel Edward Powers, Commandant of the Marine Corps Fellow at the U.S. Institute of Peace. Mr. Enrique Roig of Creative Associates International, a non-profit that provides development services and sustainable solutions to global challenges, discussed Creative’s methodology for preventing secondary violence and radicalization. Prior to their departure for New York, the participants took part in the "Global Coalition Conference on the Defeat of ISIS" at the U.S. Department of State, where they shared best practices in defeating Da'esh with public and private sector experts. The State Department program branch in New York began the group's local itinerary with an appointment with the United Nations Security Council Counter Terrorism Committee and Executive Directorate, where they shared technical expertise in addressing the abuse of information and communication technologies by terrorists and terrorist groups. A meeting with the Arab-American Family Support Center, a non-profit organization that offers resettlement, cultural, and linguistic services to the local immigrant communities, highlighted the importance of working with vulnerable populations to prevent radicalization. A tour of the 9/11 Memorial & Museum provided a key to understanding what Americans went through on that day. At a working breakfast with New York University Professor Dr. Collete Mazzucelli, everyone shared approaches to countering violent extremism and resolving conflicts. . Before departing for Charleston, the group had one final combined meeting with the Interfaith Center of New York and the Women's Islamic Initiative in Spirituality and Equality. The group was warmly received by Charleston's local community based member (CBM), the Charleston Council for International Visitors after a delayed arrival due to a canceled flight. They then met with a cadet from the Citadel to discuss the military college’s involvement in the P2P (Peer-to-Peer): Challenging Extremism Initiative. The following day, the group met with the president of the National Action Network's South Carolina chapter, a representative from the Emanuel African Methodist Episcopal (AME) Church, and a staff member at the Central Mosque of Charleston to examine how the community’s response to the 2015 massacre at AME helped to encourage recovery and discourage future violence. While short, the participants found the program to be a rewarding city stop before departing for Denver. The CBM in Denver, WorldDenver, first organized a volunteer activity with Growing Colorado Kids, an organization that provides refugee youth a safe space outside of the challenges that they face in their daily lives. After a brief meeting to discuss how the organization had successfully engaged refugee youth, the participants worked on the organization's community farm. Over the weekend the participants had the opportunity to enjoy Denver's national parks and have dinner with local families through an organized home hospitality. As part of a case study on ISIS recruitment of local teens, the group met with the U.S. Attorney General's Office to discuss the challenges of preventing radicalization. The meeting with the Colorado Information Analysis Center demonstrated the multi-agency approach to combating domestic and international terrorism. The highlight of the program was a dialogue on conflict resolution with representatives of the Abrahamic Initiative, an interfaith program and forum facilitated by St. John's Episcopal Cathedral. The following day the participants set off for the final stop of their program: Minneapolis. The final local itinerary was programmed by Global Minnesota, Minneapolis's CBM. While there, participants engaged in a compelling dialogue with Mr. Dave Kleis, the Mayor of St. Cloud, on community integration challenges for newly arrived refugees. Journalists from the St. Cloud Times and staff from the community based organization #UniteCloud, a local grassroots social media movement, also shared how they work together and with the mayor to inform and unite their divided community to address the root causes of radicalism. The following day brought opportunities to interact with the creator of Average Mohamed, an online website that provides counter-dialogue to radical messages. They also met with Heartland Democracy, a non-profit that runs programs to facilitate discussions in the local community, and the Hennepin County Sheriff's Office. After these appointments concluded, the visitors took part in a final debriefing by the organizing teams at the State Department and Meridian International Center. They departed for home shortly thereafter to apply what they learned in their respective organizations.